This article is targeted at 2014 or newer (Generation 4) Subaru Foresters. 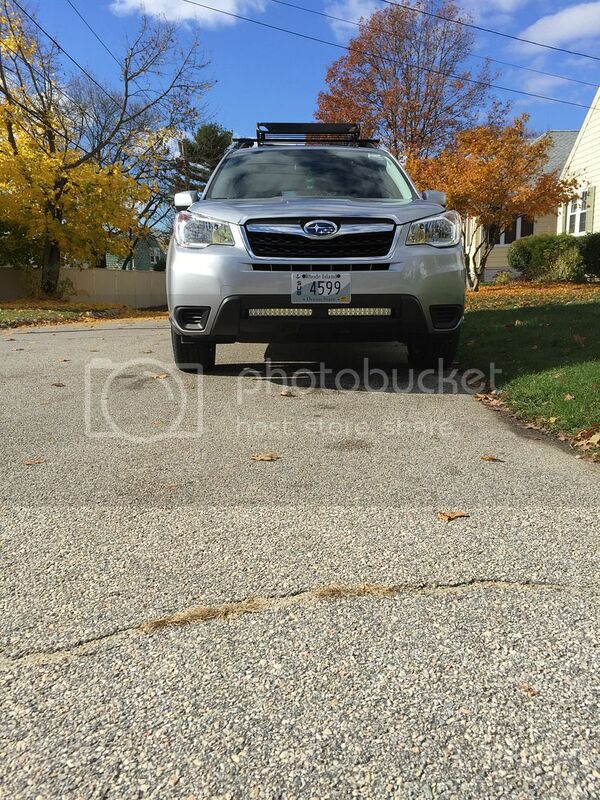 The goal is to help you find a LED light bar that will fit in your forester’s grille. The LED bar disused at the end of the post was the most affordable LED bar I could find for the Forester. As a bonus was cheaper and easier to mount than other driving/fog/rally lights and keep the forester looking clean. We will quickly cover the pros and cons of mounting a LED bar behind the grille. It will restrict air flow to the radiator. If you live someplace where it gets really hot I would think about mounting to a roof rail or some other location. Mileage should not be negatively impacted by mounting behind the grill. It is difficult to notice when it is not illuminated so the police should leave you alone. A few locations have very strict laws regarding covering off road/rally lights. The grille location will not affect air flow to the turbo intercooler or turbo. 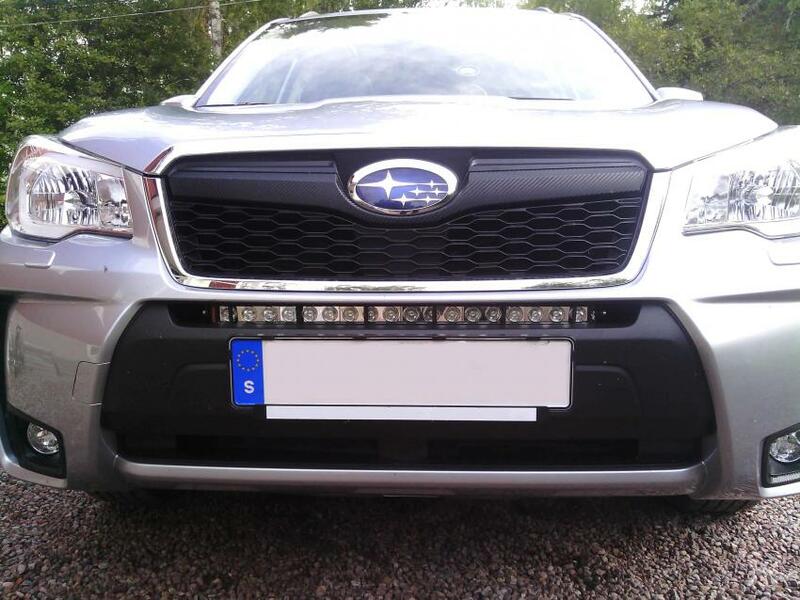 LED light bars are known to be a big ticket item and are often stolen. By mounting behind the grill you are making your LED bar nearly theft prof. The gap in the front grille is about 1.5”. You will want to find a bar that is about 40mm or 1.6” wide at the reflectors. I do not remember the exact length, but I would not try to put anything longer than 24 inches behind the bumper skirt(mounting space would get tight). With the specs above in mind you are looking at a single row LED bar. The reflectors will be the key. Most of the bars that I found with the correct specs used 5 watt LEDs. The bars that use 10 watt LEDs all had reflectors that were too tall to fit. I expect that may change in the future. Be careful to identify how the bar mounts. You will NOT have access to the back side to install nuts. I have seen three other installs I believe we all using self-tapping sheet metal screws. Bars that have adjustable mounts on either end are easily modified so that your light will be at the proper height. I used a 22” light bar that uses cree LEDs it was manufactured in china and sold by an Australian company that is drop shipping the LED bars. In total I paid ~$170 and about $10 for mounting hardware that included an aluminum backer plate (walmart straight edge). You can see my DIY installation guide for the 22 inch light bar on the Forester by clicking Here. I have since found the exact same light bar sold for over $300 without the wiring kit that came with mine so it probably is a good bar. I will recommend my light as it seems to be a good product for the money. I will be trying to build a list of lights that will work. If you find alternatives please post in the comment section or PM me on the forester forum. My user name is benjaminlately. This LED bar is cheaper and brighter than the bar below, but has a much wider beam pattern. If you happen to have a normally aspirated model you can use the lower grill opening as well. The turbo version has ducting that will stop you from using the lower location.